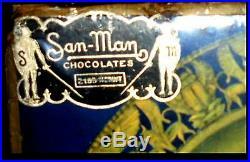 VG condition large antique San-Man candy box (1930's) 26" X 9-1/4" X 1-1/2 Still sealed in original factory cellophane and (apparently) full of chocolate candies! 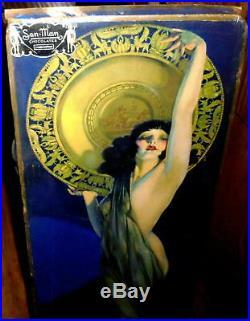 The Enchantress painting was created in 1927 by Rolf Armstrong, the top-rated pin-up artist of his day. It immediately became a rage as a cover for everything from candy boxes to sheet-music. 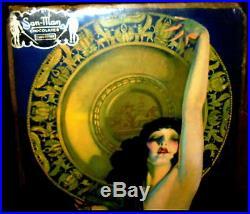 This San-Man Chocolates box (still full of chocolates) w/The Enchantress litho cover is exceedingly rare and perhaps the ONLY BOX still in existence! 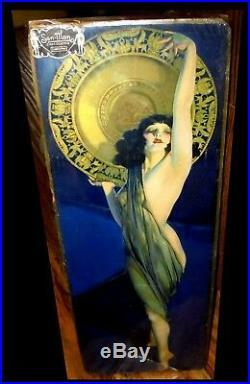 The item "ANTIQUE CANDY BOX withROLF ARMSTRONG's ENCHANTRESS LITHO ON LID! EXCEEDINGLY RARE" is in sale since Sunday, July 29, 2018. 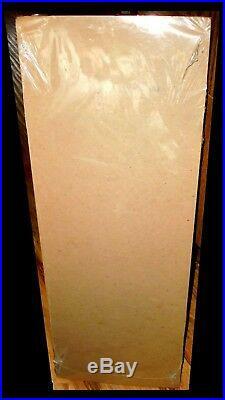 This item is in the category "Collectibles\Advertising\Food & Beverage\Candy & Nuts\Merchandise & Memorabilia". The seller is "russelohar0" and is located in Yucaipa, California. This item can be shipped worldwide.